Available for hire throughout the UK and surrounding waters. This boat is ideal for survey work, diving, filming platforms, safety standby and fast passenger transfer. Great for winter work with a fully enclosed cabin. Highlander has been purpose built for Seatrek. At 7.4m long it can be towed by a 4×4 and is easily managed by two people for launching and recovery. This vessel is ideally suited for quick response situations. 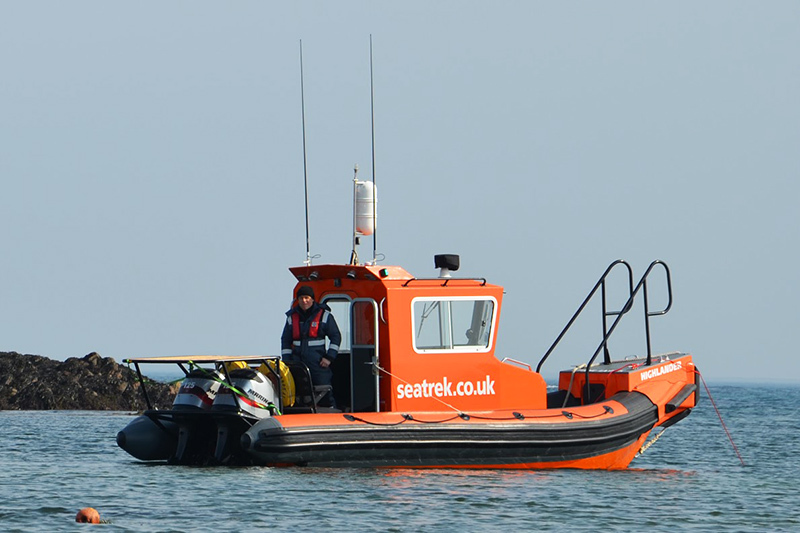 It has been designed around the proven Delta Ribs which Seatrek have operated for many years. Within the cabin area there are 4 seats to give comfort in most conditions. Outside seating consists of removable bench seating for 4. Highlander is ideal for winter work.